Question to the Giant Mosquito: Is the content on this site a joke? Answer imparted unto you: Some of it is a tongue-in-cheek exaggeration, some of it is designed to be blatantly comical and humorously ridiculous, and some of it is a disturbingly accurate depiction of the grim truth that is existence in this cold and indifferent universe in which we all temporarily reside; we leave it to you to determine which is which for yourself. So have fun with that! Question to the Giant Mosquito: Who's responsible for this?! Answer imparted unto you: Twisted Jenius was started by two likeminded villainous accomplices. They both have a deep fascination with evil, entertainment, and most importantly, money. You'll know them as False Prophet (overlord of creativity) and Vicious (overlord of logic). False Prophet is responsible for the majority of the art and writing and is the one you're most likely to interact with on social media. Vicious is responsible for many of the technical and programming aspects of the site and the games and should not be approached, spoken to, or looked at under any circumstances if you value your life. Question to the Giant Mosquito: Are you guys game developers or... what? Answer imparted unto you: Video game development is our primary focus at the moment and probably will be for the foreseeable future, but Twisted Jenius strives to be a more general, evil entertainment/media business, so don't be surprised if you see us doing other things as well. Our sinister influence cannot be constrained to fit just one medium. It yearns to spread and grow, corrupting and consuming all. Question to the Giant Mosquito: How can I contact you? Answer imparted unto you: You can contact us through our official twitter or tumblr accounts, by posting on the forum of this site, by emailing us at TheBrain@TwistedJenius.com; or by staring into the dark abyss, knowing that we are staring right back. 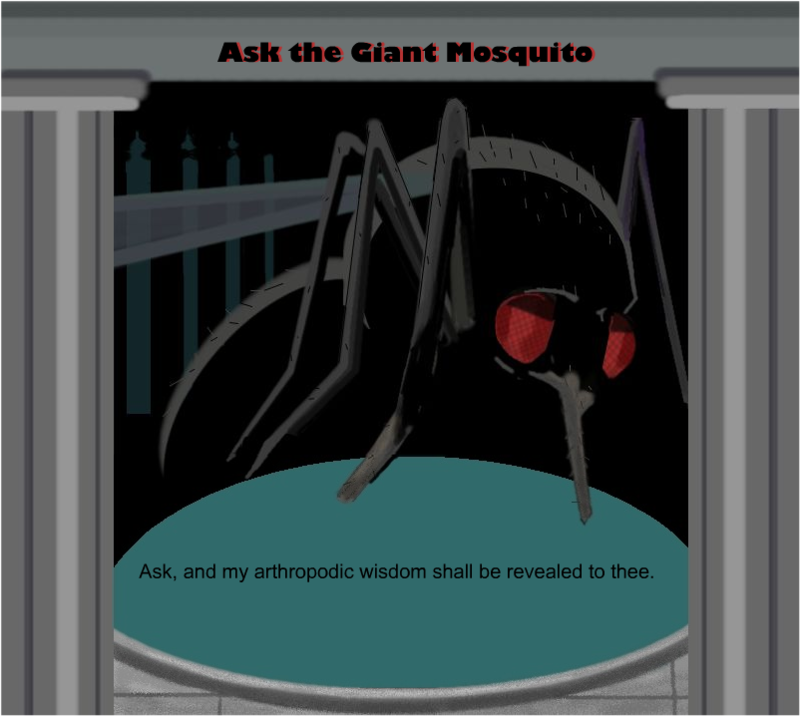 Question to the Giant Mosquito: What kind of content can we expect from you? Answer imparted unto you: We tend to like the flavors of dark comedy and horror genres. We're also likely to prepare things involving villain protagonists or things that explore an amoral/villainous philosophy. You can also expect a healthy serving of strange creatures and creepy atmosphere combined with some over-the-top silliness. In short our menu includes the bizarre and the surreal, the evil and the ridiculous. Our offerings are not recommended for mainstream consumption and individual tastes may vary. Question to the Giant Mosquito: Who is Twisty? Answer imparted unto you: Twisty is our official mascot and the entity whose silhouette graces the Twisted Jenius logo. He is the brain in the straitjacket with teeth underneath, that was originally featured in our old site intro and later starred in his own game Twisty's Asylum Escapades. He is a symbolic representation of the virtues of Twisted Jenius, namely rebellious creativity (insanity) and true intelligence (evil mastermind). For now he is our company's mascot, but you will call him God soon enough. Question to the Giant Mosquito: Why a giant mosquito? Answer imparted unto you: I am. I have always been. And I always will be. Get used to it! TwistedJenius.com: The downfall of civilization, straight to your desktop.